I’m looking up and in the sky there is the shiny glint of a jet airplane caught in the sun’s grasp, pushing silently east; I’m thinking there are four hundred people going somewhere else. I’m hoping that most of them realise the freedom of being 38,000 feet up and headed somewhere new. I've been noticing the vapor trails jets leave behind lately. So many planes pass over Belgium on their way to someplace else. So many. 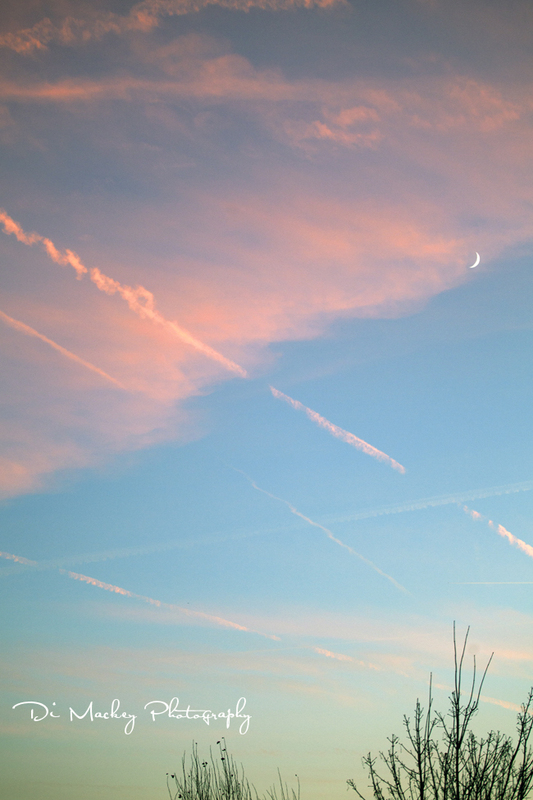 Last night, a sliver of a moon showed up early, the sky was blue but with a rose-tint, the one that appears in the sunset hours. I pointed my camera up from my seat here by the window and took a series of photographs.